Belgium is a gem of a country that’s home to roughly 200 breweries, the oldest one dating back to the 16th century. From Trappist beers to Lambics (and a dozen other styles), this small country produces some of the world’s (oldest) and most beloved beer. Right below Oktoberfest, a trip to Belgium is on every beer drinker’s ‘bucket list’. While Belgium is a long 12 hour plane ride away, there’s a beer bar much closer than that here in Austin. That place is Mort Subite (which translates to “sudden death” in French). It feels so authentic that you’re likely to be tricked into thinking you’ve landed in the heart of Belgium’s beer scene. 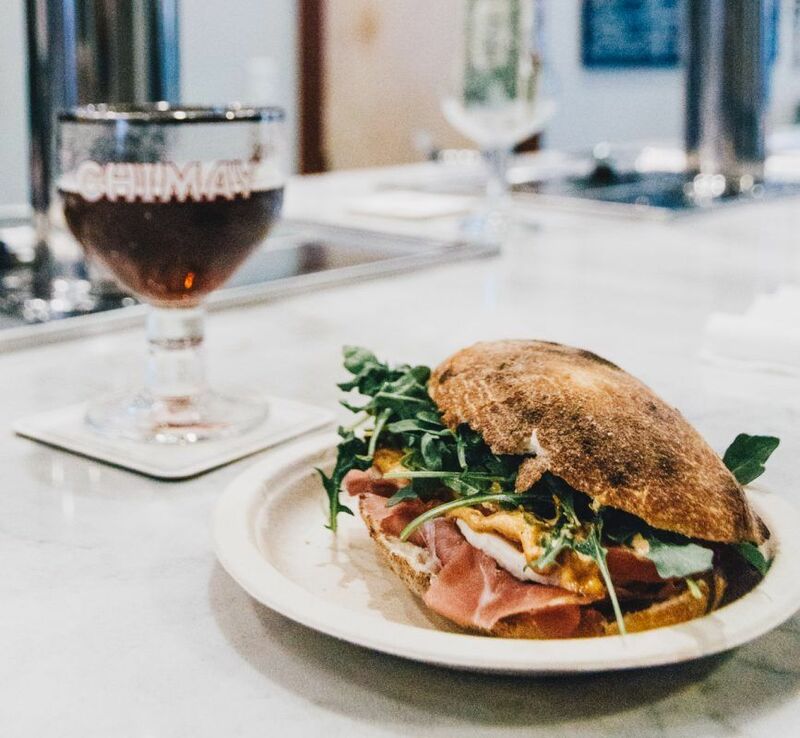 Mort Subite is located a stone’s throw from the State Capital and is Austin’s first and only Belgian beer bar. 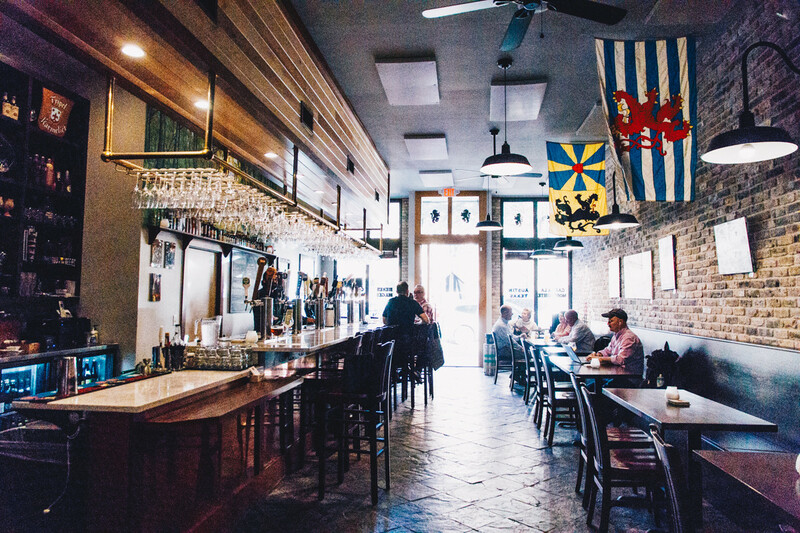 Owner, James Jackson Leach strives to ensure that his bar is as authentic to a Belgian beer bar as possible. To him, this is how he can help preserve the legacy and craft that is Belgian beer culture. Fun Fact: Just two doors down from Mort Subite, the now-closed Gambrinus bar sold the first Belgian beer in the U.S., Duvel in 1979. While Mort Subite might not be an ideal spot to come and work quietly on your laptop, but it’s a perfect spot if you need to impressive a beer drinker, business or pleasure. Exposed brick lines the far wall, with a gorgeous white marble bar that beckons you as soon as you step in. Above the bar are sparkling rows of beer glasses in enough shapes and sizes to show you just how serious they are about proper glassware here. The Belgian flags flapping above make you feel like you’re in a neighborhood pub far from the capital of Texas. Keep traveling down Mort Subite’s historical building and you’ll come outside to a small, shaded patio. There’s a food truck out back, but I’ll tell you more about that later. Mort Subite’s authenticity isn’t skin-deep; this place goes all the way. 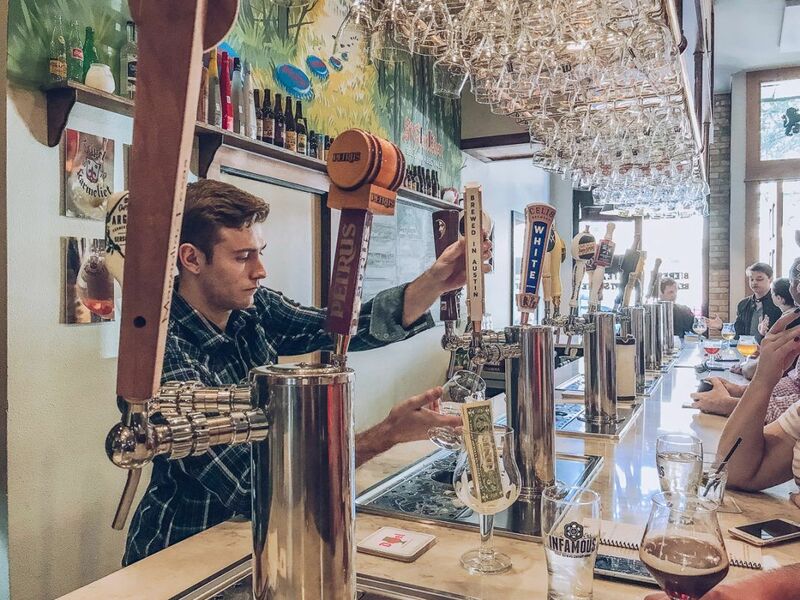 There’s over 20 taps and 40-some bottles all imported from Belgium, the motherland of beer. 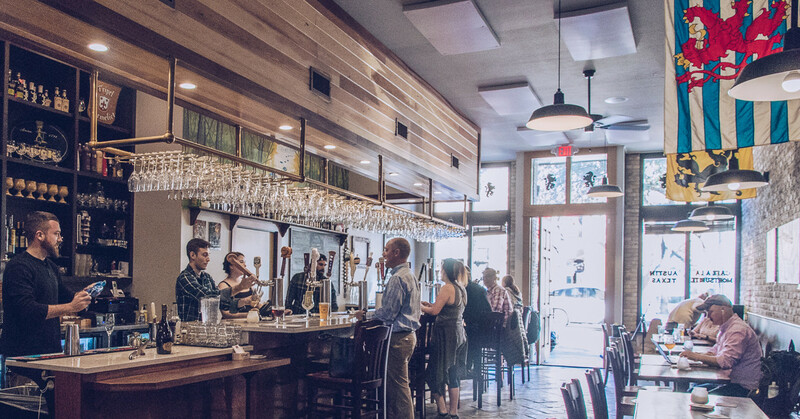 There’s a whole country to explore on the menu at this downtown Austin beer bar! Belgians don’t just make some of the best beers in the history of beer, they’re quite the stickler for proper pouring and proper glasses. If you’ve been to Belgium, you’ll be pleased to hear that all of the bartenders have been trained to be ‘sticklers’ for this. 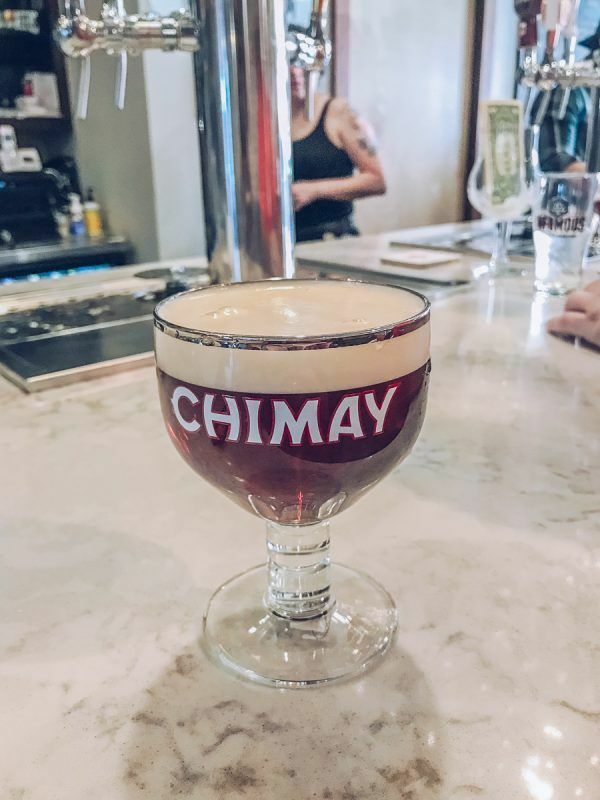 Brewed since 1982, Chimay Première is the first beer ever produced by the Trappist monks of Notre-Dame de Scourmont Abbey in Belgium. This copper-colored ale boasts flavors of apricots, brown sugar and nutmeg. And if you haven’t been to Belgium, come prepared to be blown away by the tradition in which Mort Subite’s bartenders present your beer. Each beer will be an experience that varies by style and brewery. They each have their own (branded) glass that allows them to be poured, served, and enjoyed as the brewer intended. It’s really a thoughtful anecdote that goes far back in Belgium’s rich beer culture. Don’t worry if you’re not feeling any of those ‘fancy’ European beers either. 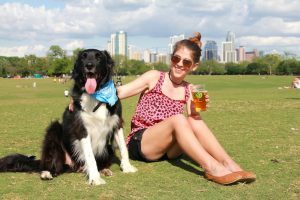 Mort Subite shows plenty of love for the talented Austin craft beer scene, offering a comfortable selection of local beers that will feel like home. 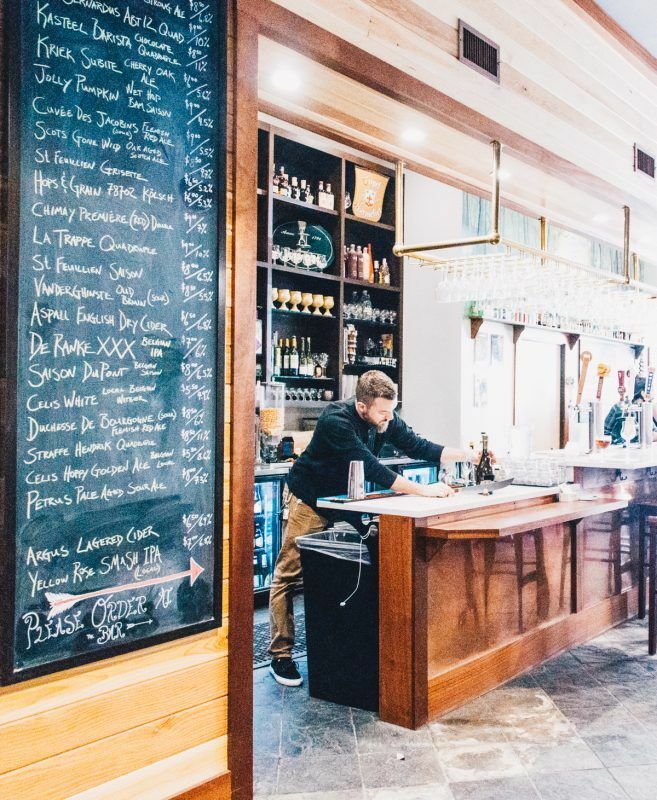 In addition to an exceptionally curated Belgian beer program, Mort Subite offers a selection of Belgian spirits, including a variety of genevers, l’eau de vilees and liqueurs. Along with a cocktail list full of new concoctions, there’s a few beer cocktails sprinkled in the mix. If the ingredient list scares you, don’t be shy to ask the bartenders for recommendations or an explanation! Belgian beers pack a punch. Luckily there’s Lucky’s Puccias, a delicious food truck on Mort Subite’s patio creating authentic Italian sandwiches. Known as puccias, they’re great at soaking up some of that high ABV beer. Lucky’s starts by baking the bread fresh in a wood-fired oven. There are plenty of combinations but all use fresh and traditional Italian ingredients. I ordered the classic Lucky’s sandwich and stuck around to check out my sandwich baking in the oven. 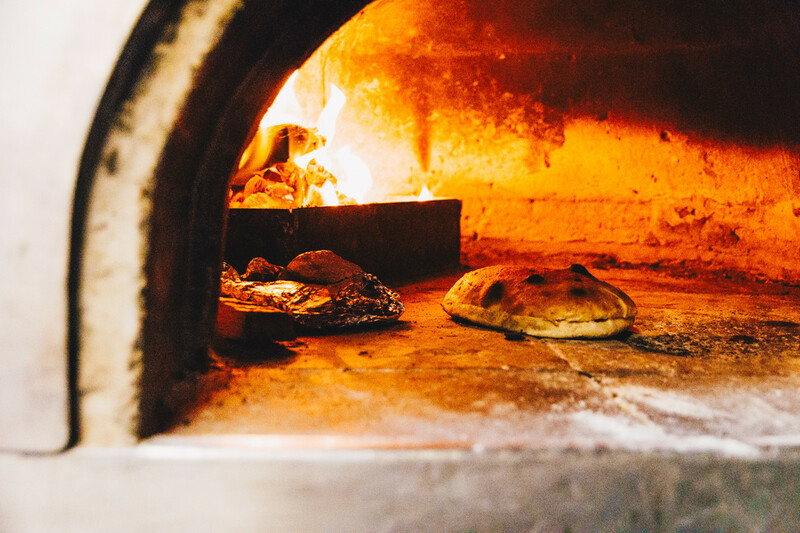 The wood-fire oven is at such a high temperature, it only takes a few minutes for the bread to bake. Once it’s done and sliced in half, the ingredients go in, getting perfectly melted from the heat of the fresh bread. While I was there, Leach mentioned the next exciting step for the bar would be expanding with a new front patio. He’s bought the two parking spots out front and plans to turn it into a small patio area. Once built, you’ll be able to sit out on Congress and enjoy a properly poured Belgian beer against the backdrop of downtown’s hustle and bustle. What’s your favorite Belgian beer? Let me know in the comments! Oh my gosh this is making me miss good Belgian beer! Absolutely love it and drinking beer in Belgium was actually the first time I ever ENJOYED my beer!